Garlic Edamame has two stories that go along with it; the first about an organic farmer, and the second about a country club in Lanikai, Hawaii. Consider this a bonus post, two stories for the price of one! 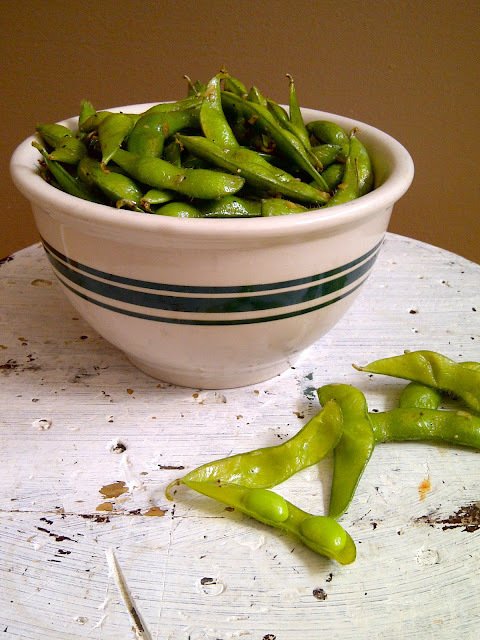 For the longest time I bought shelled edamame, in frozen brick-like form, thawed it and either roasted them or added them to rice and soup dishes. 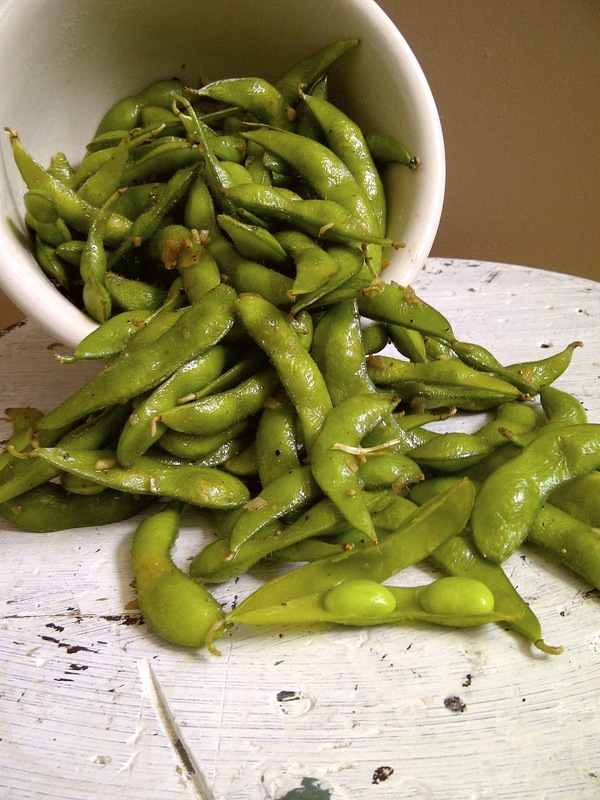 I knew edamame beans were soybeans….I thought they were a specific type, a certain variety of soybeans. 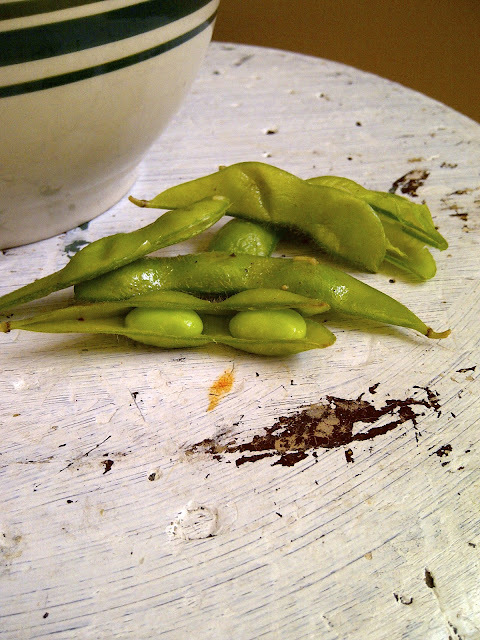 I didn’t realize that edamame beans are simply soybeans in the early developmental stage - small tender beans in the pod. I first learned this several years ago from an organic farmer in Skowhegan, Maine. We rented an old farmhouse from “Fammah Bob”; he lived and farmed on +/- 175 acres….and he farmed all those acres ORGANICALLY!! Fammah Bob grew soy, corn, and hay, again, all organic and allGMO-free. So not only was he a rockstar in our eyes for making the conscience decision and exerting the effort to do so, but in turn, his crops also helped sustain an organic beef operation, Caldwell Farms in somewhere, ME, as they purchased Bob’s crops to feed their cow herd. However, farming is only a part of Bob’s job/life…he is also an on-call Emergency Surgical Nurse. Many a times have we driven down our road to find his tractor, and various farming implements, parked in odd positions out in in the field. At these times, either during haying, plowing, harrowing, or harvesting, Bob had gotten “the call” from the hospital that there was an emergency and he needed to “scrub in”. Quickly abandoning his farming duties, he rushed to assist in the ER when needed. When finished, he got right back to business in the fields, hopping on the tractor and continuing on with the farm duties. So that’s like, triple-bonus karma points for Fammah Bob, not only for growing and supporting the organic industry, but for helping save the lives of the ER patients, and for helping saving the planets, one little organic edamame at a time. 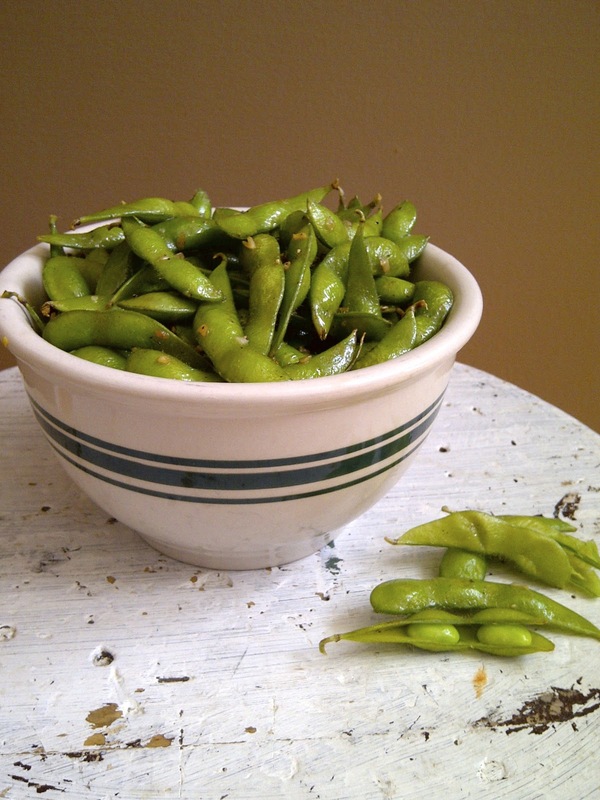 The first time I ever had garlic edamame was in Hawaii. S had a business dinner scheduled during our vacation. Come to find out, we were meeting at the Mid Pack Country Club in Lanikai, Hawaii. I have never been to a country club before…I had visions of grandeur, for I had watched Caddyshack, Dirty Dancing, and the Karate Kid far too many times (all having scenes taking place in a country club – this was my benchmark). The grounds were beautiful; the course is fantastic (I’m told – not a golfer). It was very…low key. There was no Rodney Dangerfield. No dancing to a live orchestra. No putting Baby in the corner. Our drinks arrived served with two massive bowls of edamame; one bowl of steamed, plain pods (which I have had before, and always enjoy), one bowl of garlic edamame. I was in love!! Granted, probably not ideal for a first date, or something of that nature, because there was a metric ton (!) of garlic on those pods...but great for fending off vampires (if you are into that sort of thing...and, Twilight-mania says you are!). The garlic was sauteed with the pods, it browned and caramelized to a delicious state. It was wicked! Great for summer entertaining, alongside cocktails, or as an appetizer…you gotta try it! In a large saute pan, heat the olive oil and garlic over medium-high heat. As the oil heats up the garlic will start to sizzle and bubble, when this happens stir to prevent it from sticking to the pan. When garlic has turned from opaque to translucent, then to a slightly golden color, add the frozen pods. Stir well to coat the edamame. As the edamame cooks it releases a little moisture preventing the garlic from burning. Continue to cook for another 5-6 minutes, stirring occasionally until the edamame is no longer frozen and begins to brown. To eat: Crack open the pod with your teeth and squeeze the beans directly from the pod into your mouth. Alternatively, open the pods with your fingers and eat the beans...but you won't get the full flavor of the garlic. Discard the pods. Fammah Bob is clearly da bomb! I love edamame and eat it all the time. I have some in my fridge now and I'm totally trying this recipe, as it looks super easy. This sounds really tasty! I know exactly the place you're talking about in Hawaii. I've never eaten there, but I drove by just yesterday! Thanks Natashalh! Was it still low-key? Or is all the par-taying going on now that I'm back on the mainland? I'm here from the Creative Mondays Blog Hop. Love the recipe!!! 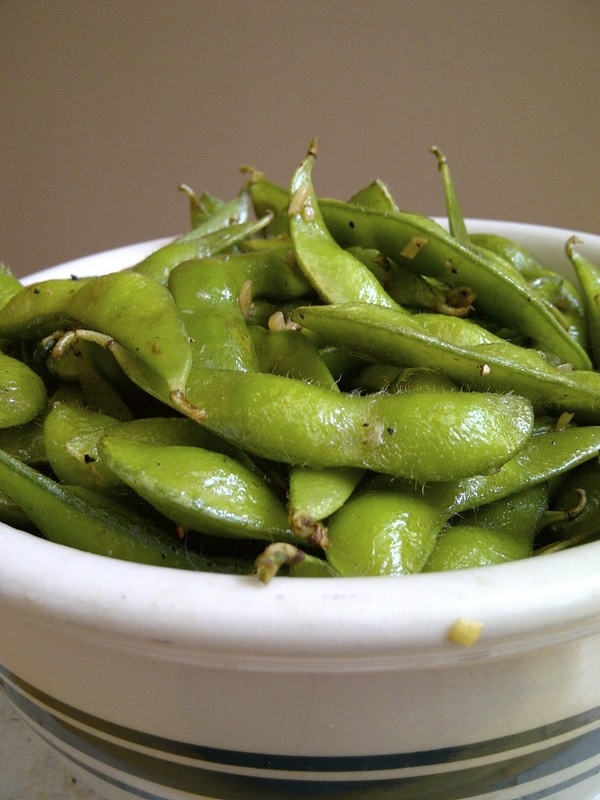 I can eat a lot of edamame and I love garlic - so this is the perfect combination. Do you have a follower bottom or I have to follow the blog via email? I also love Edamame, I'm going to try it at home. Thanks for reading & stopping by to comment!! Very interesting Kim! I would like to try this. They remind me of string beans. Thanks, Judy...String beans would work, also. You'd probably still need a breath mint after from all the garlic :) I speak form experience!! They are good, and you're right, I never thought to try making them either until I had them for the first time. Following you back :) Thanks for stopping by, I will check out your linky. 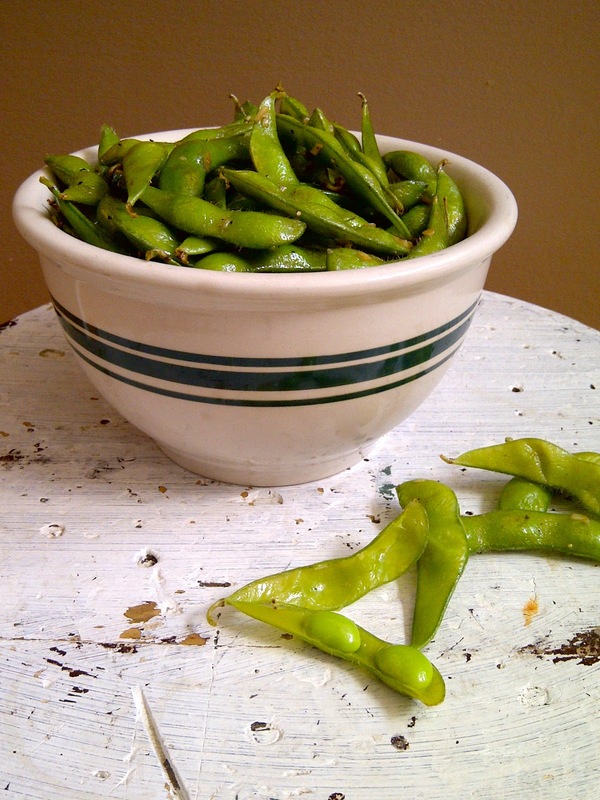 Edamame is one of my families favorites. I usually just steam them and throw a little sea salt on them and the kids will snack on them throughout the day. Thanks for coming by and sharing! I really look forward to seeing what you're going to link up. If you like garlic, then you must try these...it adds a lot of flavor. Thanks for stopping by Robin!! Hi there! I am co-hosting this week on the Fluster's Creative Muster Party. Thanks for sharing your creations with us! 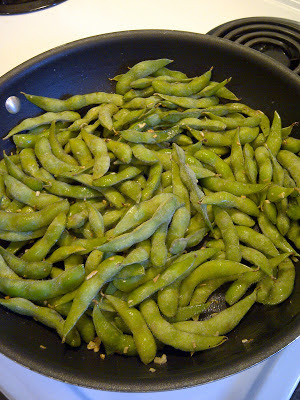 I love edamame straight from the container! I eat them like popcorn. I hope you found inspiration in all of the terrific posts. What a fun story about Fammah Bob! I've never had success with buying frozen edamame. They always seem to come out too stringy, and unchewable. I'll have to see if I can find some fresh somewhere. I have actually only had frozen...it's always been more cost effective. I don't eat the pods though, some people do, I've always discarded them....after sucking off all the garlicy stuff. I'll have to try that then. Get rid of the pods. Farmer Bob sounds like a very special soul. Great to hear about a person like him. I was visting my boyfriend's parents once in Boca Raton. He was so excited about showing me his country club. I guess I came off as unimpressed. His father just shruggled and said to his son. "She's from CT, she's seen better." Fammah Bob is a stand up guy. We love garlic at my house and have only recently started eating edamame (my stores only recently started carrying it). Funny enough, I just tossed a handful of shelled edamame in a zucchini, tomato saute for dinner. Anyway...all this garlic sounds super! Thanks for linking up this week! Fammah Bob is da' bomb!! Thanks for stopping by Michelle! !